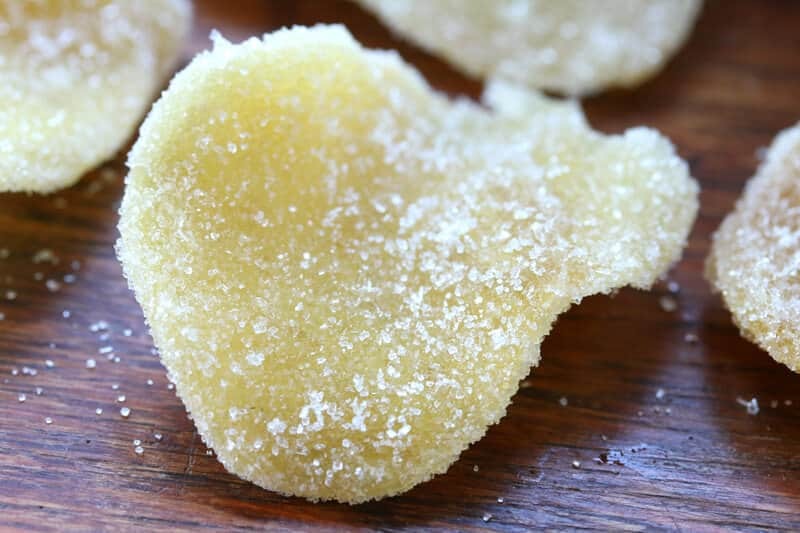 Have you ever come across a recipe calling for crystallized ginger but passed because you didn’t have any, couldn’t find any in the store, or just didn’t want to bother trying to find it? Or have you thought about making it yourself but weren’t sure how or figured it would be too much work? Well this is for you! 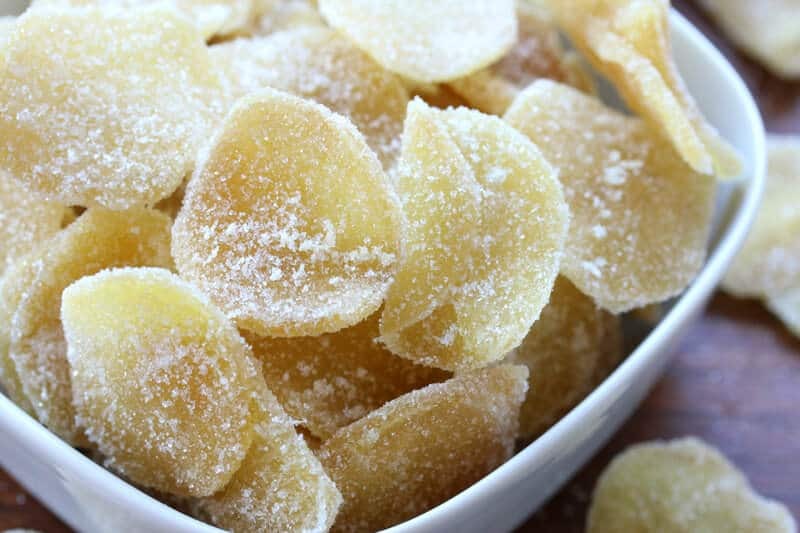 If you like crystallized ginger just wait until you’ve tried homemade! The flavor is worlds better – so much fresher with a stronger, more vibrant flavor. And if you don’t care for crystallized ginger, you’ll be converted once you’ve tried it in a few recipes (see ideas below). Because it’s so fresh, and you know the source, you can also reap the health benefits of ginger. Ginger has been used medicinally for centuries. Ginger is an extremely healthy herb with a variety of benefits. Research has shown it to be effective in treating upset stomachs, nausea, motion-sickness, pregnancy (eat up, mothers! ), lowering cholesterol and inflammation, preventing clogged arteries and may even kill cancer cells. Health benefits of ginger aside, some of you may be asking “Why would I even want crystallized ginger?” I’ll tell you! 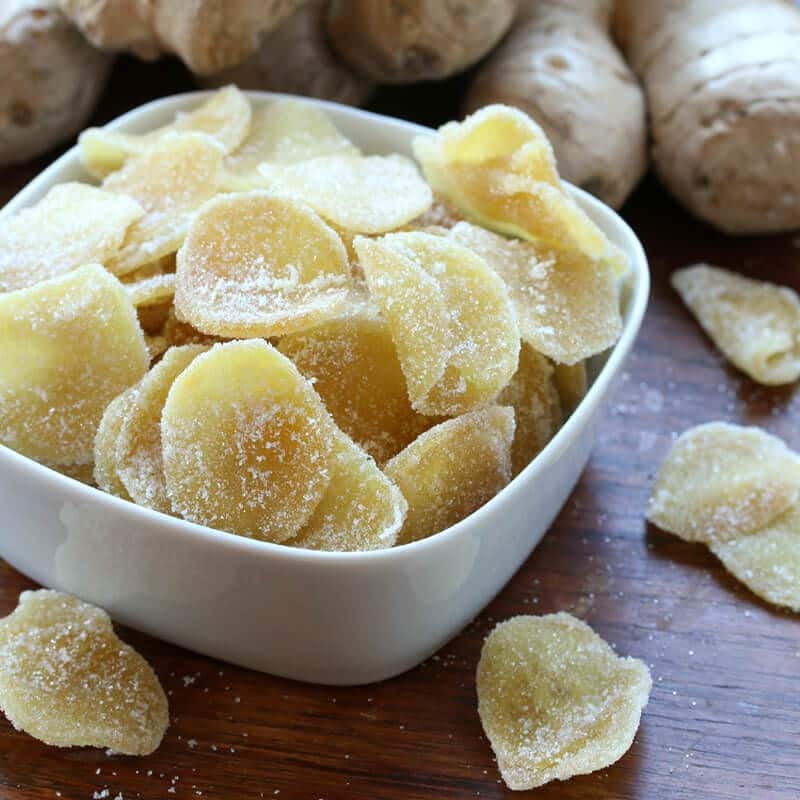 Crystallized ginger (aka candied ginger) is not only a yummy snack on its own, it’s a versatile ingredient that will liven up so many dishes! Bottom line: This makes a large batch, keeps for months, and you will be so glad to have it on hand. Add it to the following: Banana bread, sugar cookies, citrus salad, granola bars, cakes, pies, muffins, cupcakes, shortbread, pancakes, waffles, sprinkled over ice cream, lemon bread, pound cake (try my Preserved Lemon Ginger Pound Cake), ginger snaps, cranberry relish, pear or apple crisp, homemade jam, and the list goes on and on! 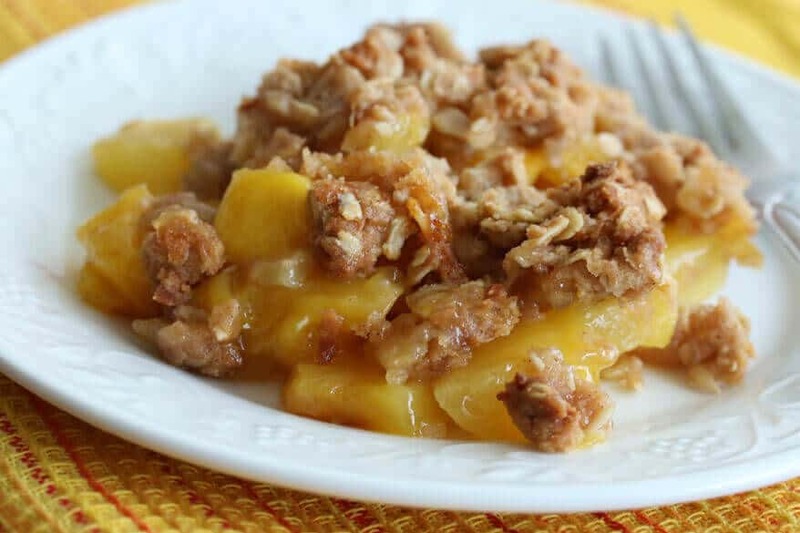 Or add it to this delicious Healthy Homemade Granola or this phenomenal Pineapple Mango Coconut Crumble with Candied Ginger. These are just a few ideas and the sky’s the limit! 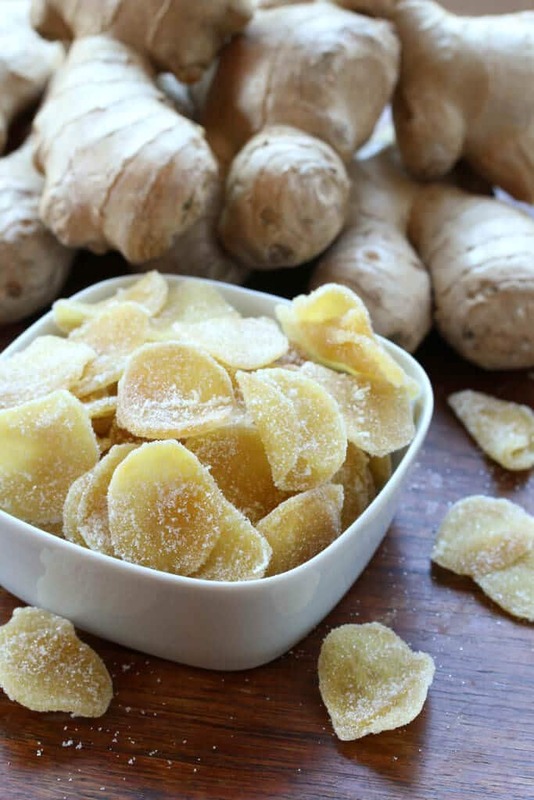 Leave a comment below: What are some other ways you’ve used candied ginger? Okay, are you ready to rock? Generally you want to use young, small ginger roots because they’re less woody/more tender. But medium-sized will work just fine as well. Most ginger is imported from China and I recommend buying organic for that reason. Peel the ginger and slice it thinly and evenly. You can either do it by hand or use a mandolin. I highly recommend the Swissmar Borner Mandolin. 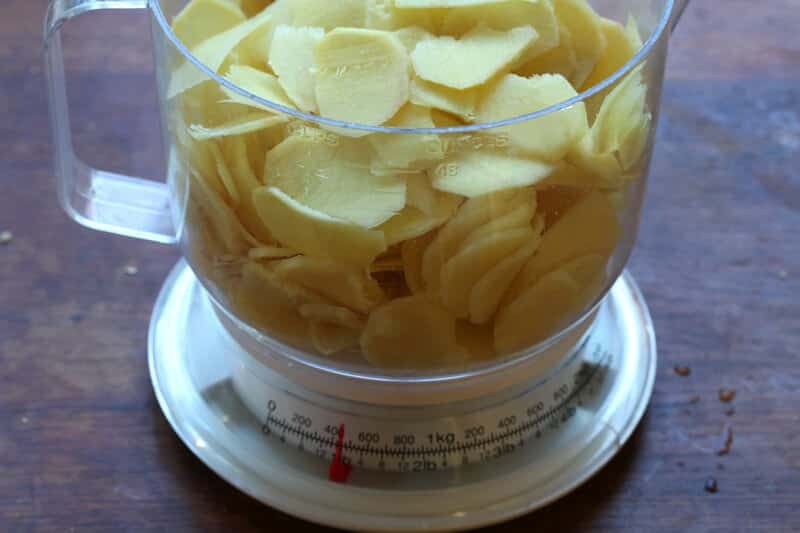 If you slice it paper thin the result will be crunchy crystallized ginger, but you also don’t want it too thick. 1/8 is thick is about right. You’ll want about 1 pound of sliced ginger. Place the sliced ginger in a medium-sized pot and cover with water and just a pinch of salt. Bring to a boil and simmer for 30 minutes. Reserve 1/2 cup of the ginger water and then drain the sliced ginger (you can also keep the ginger water for tea or a tonic). Place the reserved ginger water and sugar in the pot. Add the sliced ginger, bring it to a boil, reduce the heat to medium and simmer uncovered for about 35-40 minutes, stirring occasionally. 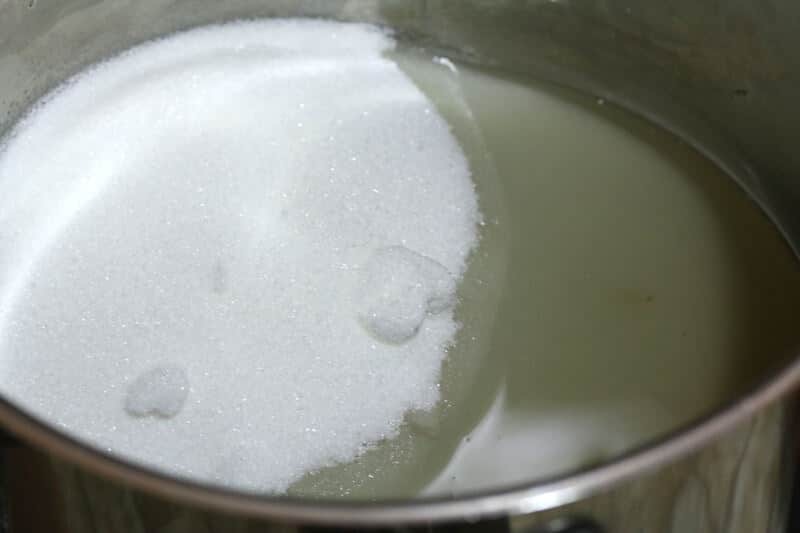 The mixture will become somewhat thickened as the sugar turns to a syrup. Simmer until a candy thermometer reads 225 degrees F. You don’t have to use a candy thermometer but it sure makes it a lot easier than guesswork. The Chef Remi Cooking Thermometer has great reviews and can be used for both candy and meats. A thermometer, in my opinion, is an essential kitchen gadget. Once the ginger mixture has reached 225 F drain the ginger immediately while hot. Use a colander over a bowl so you can collect the drained syrup. Don’t discard it. This recipe produces a delicious by product: GINGER SIMPLE SYRUP! Add a teaspoon or two to your drinks for a refreshing ZING! Lay out the ginger slices on a large cooling rack over a cookie sheet, separating the individual slices the best you can (this is the more tedious part of the process). Let the ginger sit for 2 hours so they’re sticky but not wet (you want the sugar to be able to adhere without dissolving). Toss the pieces in a bowl of sugar to coat all sides. 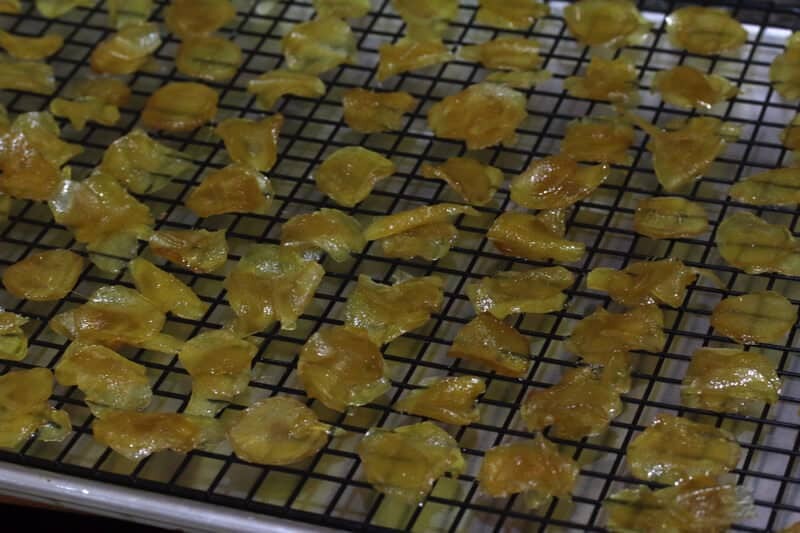 Lay the crystallized ginger back on the cooling rack to sit overnight to dry. 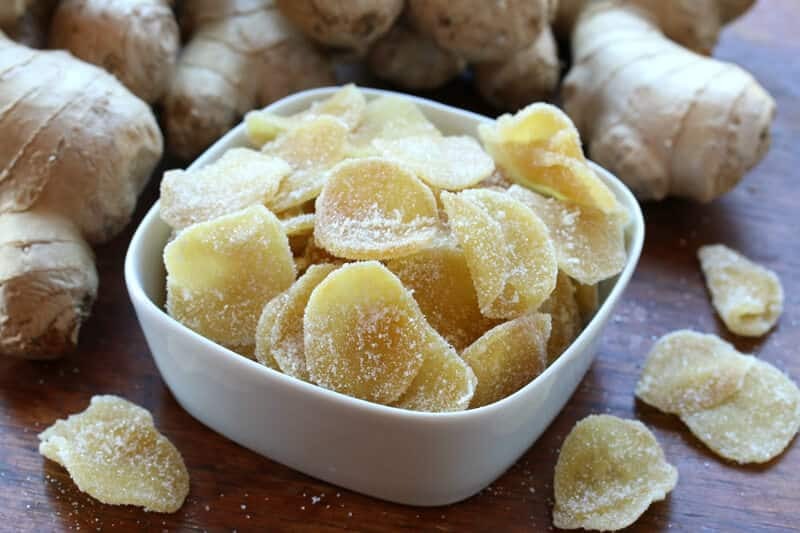 Store the crystallized ginger in an airtight container in a dark, cool place. Because it’s cooked and sugar and then coated with sugar, it will keep for several months. Place the sliced ginger in a medium pot and cover with water. Bring to a boil and simmer for 30 minutes. Reserve ½ cup of the ginger water and then drain the ginger slices. Place the sliced ginger back in the pot with the reserved ginger water, sugar and pinch of salt. Bring to a boil, reduce the heat to medium, and simmer uncovered for 35-40 minutes or until the temperature on a candy thermometer reads 225 degrees F.
Drain the ginger in a colander over a bowl to catch the syrup (see Note). 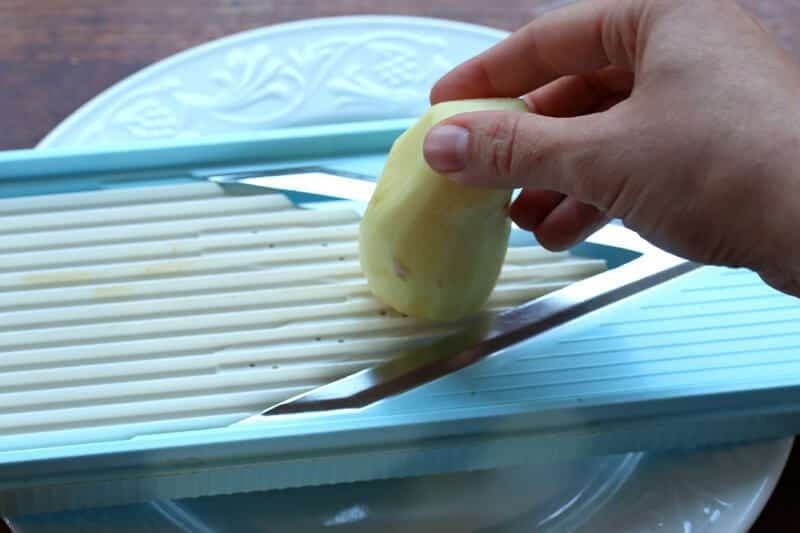 Lay out the ginger slices on a cooling rack over a cookie sheet, separating the slices the best you can. Let cool for 2 hours (you want them sticky but not wet so that the sugar will adhere without dissolving). Toss the ginger slices in a bowl of sugar so they are coated all over. Place the ginger slices back on the cooling rack to sit overnight. Store in an airtight container in a dark, cool place. Will keep for several months. 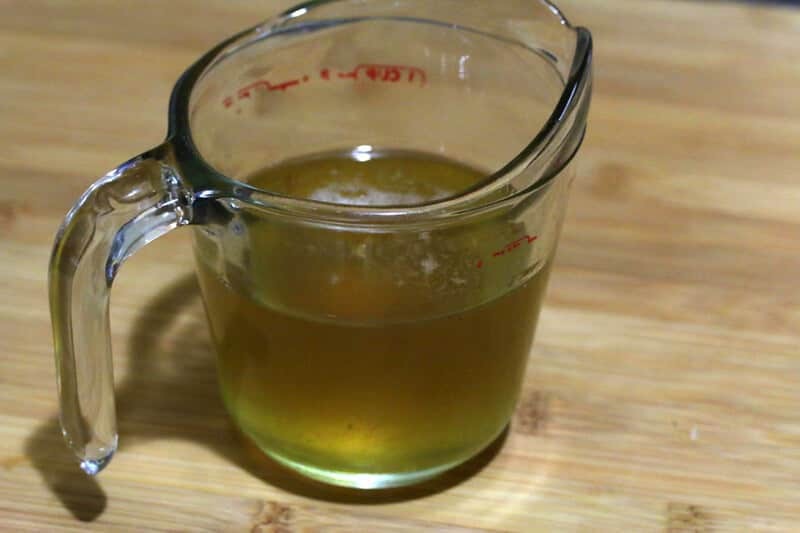 This recipe makes a delicious byproduct: Ginger Simple Syrup! Add a teaspoon or two to your drinks for a refreshing ZING! I can’t even tell you how happy I am to see this recipe!! Thank you, thank you, thank you!! I had crystalized ginger from china before but it didn’t have sugar on it. It had salt instead. I loved it but can’t find it anywhere. I’m thinking of trying this recipe and replacing the sugar with salt. Do you think this would work? Hi Laurene, sugar and salt are both preservatives so yes, salt will work. You just saved me about 50 dollars a month – that’s how much my family consumes. Was buying bags at costco until they stopped carrying it. I made this once, many years ago (in the 1980s) following directions from Sunset Magazine. They had you boil the ginger and change the water at least half a dozen times, to cut the heat of the ginger (it was still hot – flavor was still strong). For people who are concerned about the strength of the ginger flavor, I recommend doing it with the water changes. I’m really glad you posted this. I’d forgotten all about making my own candied ginger. My favorite way to use it is in a recipe called Triple the Ginger Cookies that I found on Allrecipes.com many years ago. My favorite cookie ever! Thank you jesusan, I found the ginger really strong. I will try your recommendation and throw the water a few time. I saw a similar recipe when I lived in germany. In that one it had to be boiled in a half bottle of wine. Then an equal weight of sugar was added and it was futher coooked. Then drained and dried in the oven, while the wine syrup reduced slightly. There were then cycles of coating and drying the ginger (in the syrup). Even with slightly fibrous ginger it produced very tender ginger that lasted circa one year (if not gobbled up). This looks amazing. 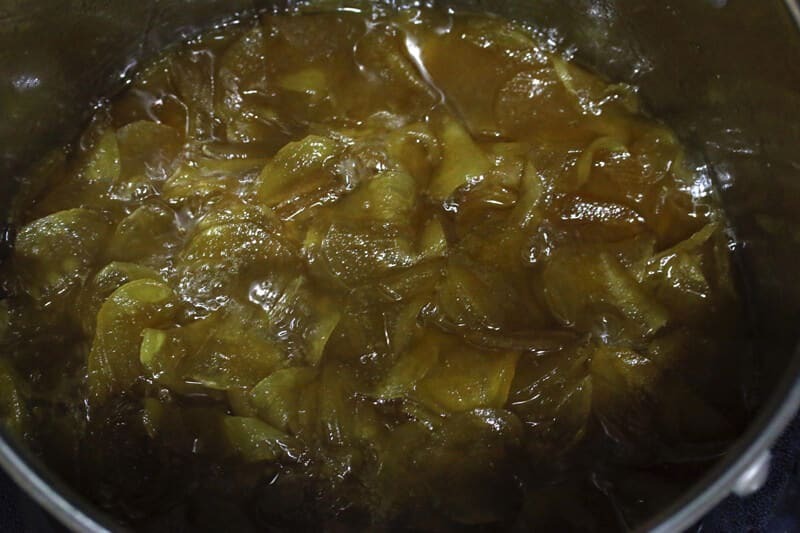 I tried making candied ginger a few years ago – a complete failure, I threw everthing away. I think following your recipe will bring me better results. Oh no, Adina, that’s always so frustrating! Yes, I think you’ll be very happy with the results. Really the best way to guarantee great results is to use a candy thermometer. No guesswork involved. I use crystalised ginger so rarely that I buy small jars of it when needed. I do, though, grate raw ginger into a cup of hot water with the juice from half a lime and a spoonful of honey as my morning drink. Girl! Add a shot of rum and you got one dlicious hot toddy! Thx foenthe recipie. 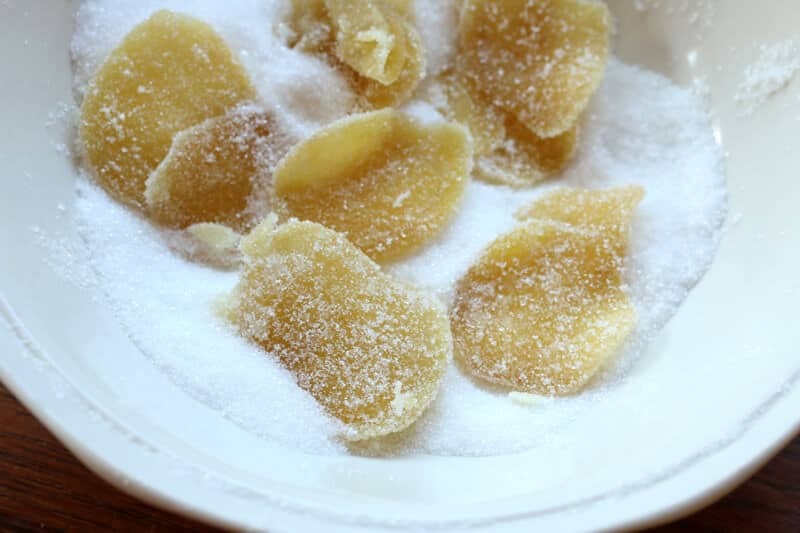 Look forward to making candied ginger…and maybe that hot toddy as well…. Lol! I made a batch of this yesterday!! Yes, it was definitely a little time-consuming laying all the pieces out on the rack to cool, but now I have a big beautiful batch of crystallized ginger that smells and tastes divine! So worth it! Thank you! I have a lot of stomach problems as well as indigestion/heartburn. The candied ginger gives me relief very quickly. For sure, Betty, ginger is amazing for that purpose! Nice post, I make a very similar recipe. I use it in a triple gingerbread recipe. Good fresh Ginger is hard to come by, yours looks amazing. I grew some a few years ago, an experiment to try to keep it fresh. Half submerged the ginger in potting soil, put it a sunny window. The ginger stayed great, new knobs started to form, and some very long green stalks grew. I used the stalks in something. Love your photos and info on saving the syrup, like a dummy first time I made it I threw it out, did not make that mistake again. Thank, Sue! We’ve been wanting to try growing our own ginger for a while and are planning on giving it a go this year. Nearly all of the ginger sold in grocery stores in the U.S. comes from China. Even most of the organic ginger I’ve seen comes from China. Why doesn’t the U.S. produce it’s own?? Crossing my fingers it grows successfully here in western WA! There is organic ginger grown in the U.S.!! Kaui Organic Farms grows its own organic ginger. Unfortunately, they only sell wholesale in bulk to businesses. So the only way to purchase it would be to find a business that buys it from them and will re-sell to you. That is the problem with making my own crystallized ginger, I don’t want to buy ginger from the store that comes from China, even if it is organic. Many stores in California in 2015 were named in a lawsuit because they violated CA Prop. 65 by failing to label ginger candy and crystallized ginger that all came from China with a lead content warning. So I have only been buying organic crystallized ginger that comes from Fiji. It is expensive at $14/lb, but it is the only way I can enjoy eating ginger without having to worry about brain damage from consuming lead. The next time I go back home to Hawaii I will buy some organic Hawaiian Ginger and then I will try your recipe to bring back to the mainland with me. Old Friends Farm in Amherst, Massachusetts been growing organic ginger for years, it is excellent, only available from Aug. through Nov., there are several other growers to in the U.S. The ginger is more perishable then what we get at the grocery store but freezes extremely well. I get some when I can find it and prefer it because it is not as fibrous. I particularly love it in a triple gingerbread I make and I love it in a bread and butter pickle recipe. Good luck growing it, I remember that it takes quite a while to start sprouting and you will love what you can do with the stalks, flavors soups, stuff it in a roasting chicken to give it an unusual twist, just remove the stalks, you cannot eat them they are to fiborous, similar to lemon grass only with that lovely ginger flavor. Maybe I will start a pot of ginger myself. Cannot have sugar. Could we use Stevia? Hi Lydia, sugar is what acts as the preservative for longer term storage. No other sugar substitutes have the preservative qualities that make long-term storage possible. If you’re not planning on storing the crystallized ginger but plan on eating it quickly, like within two or three days, I’m sure there is a way to make stevia work. It would require some additional changes to the recipe and directions. You can ferment ginger in honey for another type of solution. It will truly ferment though. Stevia is out, but you might try Xylitol. It’s a little more expensive, but a crystal and almost identical to sugar. Thank you for the recipe. I am looking this for months in local stores but not found. We have plenty of good ginger even in home gardens and make different way like ginger dosi but not this finally thought of make myself and found your page and was so happy. I used to have it specially when my throat get irritated or having cough. It helps much. Used to buy from Iranian and Chinese sweet shops in Dubai. One Chinese recipe make it much dry and crispy. Is this same? We use ginger for our day to day cooking ,home remedies and as a herbal medicine. If someone likes could share . Thank you again. will try soon. Hi Sharma, thank you for your note. 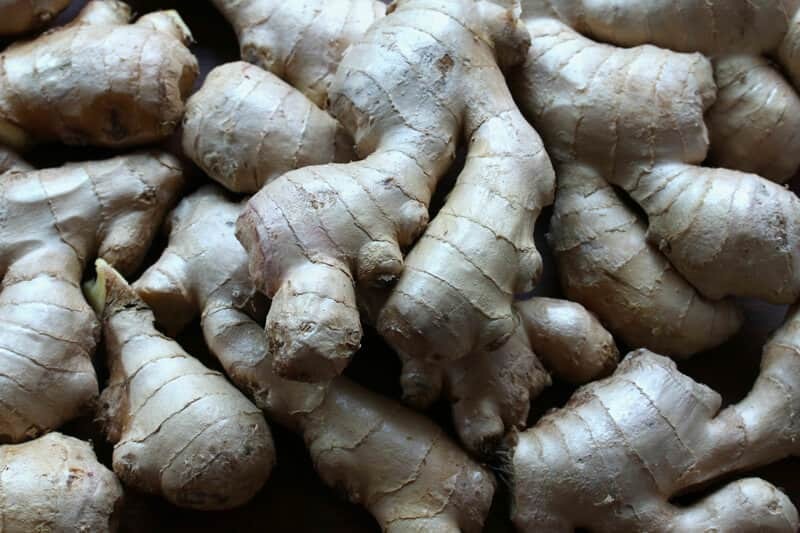 Ginger is wonderful for so many things – cooking and medicine. 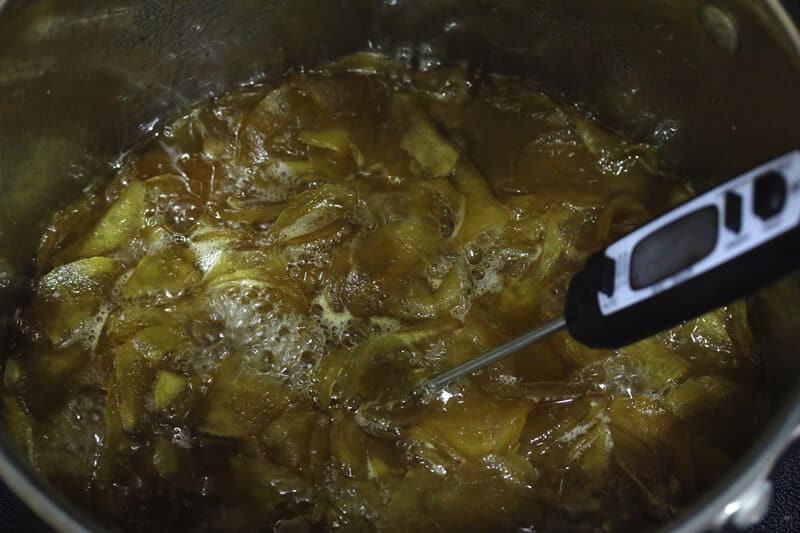 Whether the crystallized ginger is crispy just depends on how thick you slice it. The thicker it is, the chewier it will be, the thinner it is, the crispier and crunchy it will be. Nice recipe. Thank you! I had a small piece of Ginger left over from the tiny amount that needed in a dip for Ahi Tuna so I thought I would give it a try. Wow…great! and I’m a expert on crystallized ginger..eating it.. not making it..I’ve loved it all my life. As an expert eater of crystallized Ginger your approval goes a long way, Mike, thank you! I haven’t made it with brown sugar, lonut, but yes I think it should work. I grow ginger here in Texas throughout the summer months. It likes warm or hot weather. It will die back in the winter months. Thanks for the info Bernice. I’d love to grow my own ginger but don’t think it will do so well here in WA. I may experiment trying to grow it in our greenhouse where the temperature is hotter. Bernice: I live in East Texas Zone 9.4 – 8.3. What part do you like in? I want to try growing some ginger. Mr Tim. Can we substitute sugar with jaggery ? Hi Narayan, that’s a good question. From a flavor standpoint, yes, jaggery can be used. From a preserving/long-term storage standpoint I’m not sure and welcome any input from our readers. I am so happy to see this recipe. Thanks for sharing, I cant wait to try it. I love to small dice and put it in zuchini bread, or tea! Adding it to zucchini bread sounds like a terrific way to put it to use, thanks for the tip, Tam! I’m making some this weekend…. It works wonders in homemade Cassata-style ice-cream along with rum marinated raisins and other crystalised fruit. Goodness, Kevin, I haven’t even had breakfast yet and you’re making me crave ice cream! :) That sounds delicious! You are a trooper, Kevin, I’d go nuts after four batches! Thanks for the feedback and for those awesome tips! Awesome tips ! Getting ready to try, so your tips are quite timely ! Thank You ! That’s terrific, Fatima, thank you! I pulled up a basket full of ginger out of my flower bed yesterday. I immediately started looking for recipes for candied ginger. I plan to make a batch tomorrow using your recipe. We just got back from NY where we went apple picking with our grandchildren. I managed to bring home enough for a mile high apple pie and I plan on adding candied ginger. Thanks for all the hints on how to use the ginger. You’re welcome, IDA, thanks for stopping by! 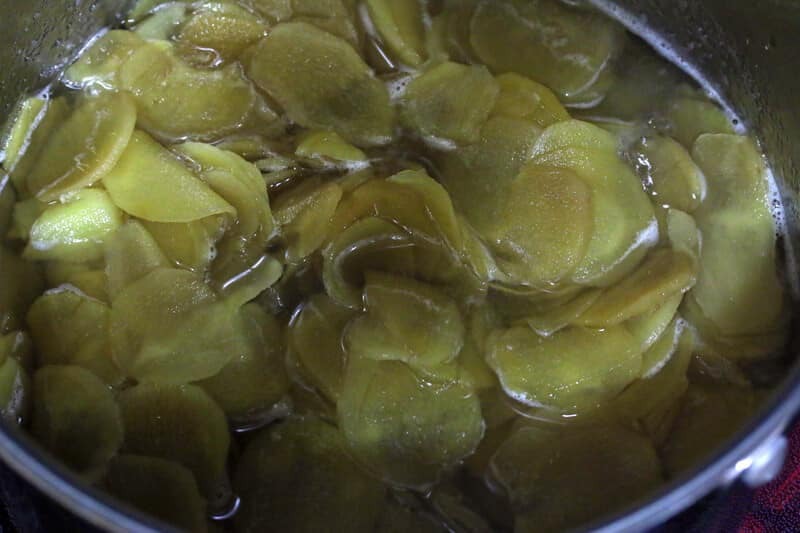 Crystallized ginger adds zing to a cup of tea with honey. When you get to the bottom of the cup after drinking the tea, you have a nice, juicy piece of rehydrated ginger to savor. Great tip, Chana, thank you! That’s exactly how I use it too, funny. Love crunching on the ginger after it has rehydrated. It’s got a beautiful texture & tastes amazing, not to mention the benefits to the immune & digestive systems. It’s especially good with honey & milk mixed in. Lazy girl’s chai for when I don’t have the energy to grind up all my custom blend of chai spices by hand in the mortar & pestle. Hi Jeff, yes you can use coconut sugar but as far as its preservative qualities (ie, will it preserve the fruit as long as traditional regular sugar), I’m not sure. i am going to try this.India is top producer of ginger.mostly fresh and dried ginger is sold. value added products are not made much. i want to start making value added ginger products.ginger candy is one such product.it will help me. I love to add a slice of crystallized ginger to a cup of either peach or plain tea!! Great tip, Deanna, thank you! I have been looking for a good, simple straight forward recipe for candy ginger glad I found yours. It sounds absolutely great. I recently bought 500 gm from a major Super Market; I was shocked what they charged me, when regular ginger is 69 cents a pound in many stores. I will try your recipe. If you have recipe for ginger as the ginger served in Japanese restaurants with Sushi, I will appreciate that. Hi Justin, no kidding! As cheap as it is fresh it is crazy what they charge just to add a few cents of sugar to it. I know exactly what you’re referring to with the pickled ginger because my husband is a total sushi nut :) I’ve actually been planning on posting a recipe for that. It may not be for a while yet but thanks for the reminder! Hi Kimberly, Thanks for the recipe. I love Ginger. I’ve been adding Ginger to my smoothies or buying crystallized Ginger from Wholefoods. I was just visiting my boys, and they had gotten me a pound of Ginger form Wholefoods that I didn’t know what do it. 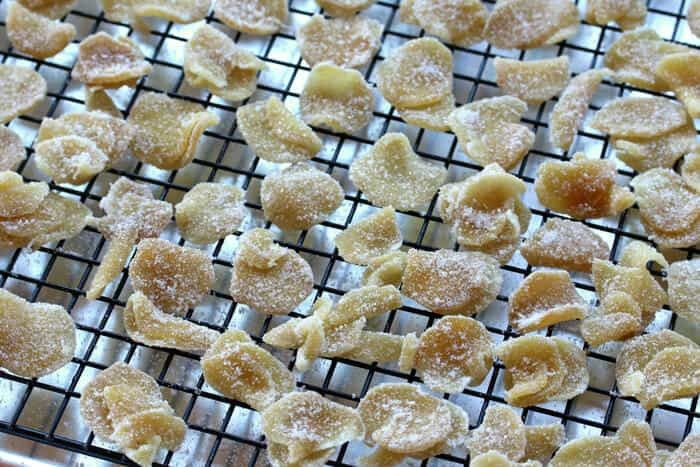 The idea of making my own Crystallized Ginger Candies came to my mind, and I just saw your recipe. I’m planning to do it with Coconut Sugar. Fantastic, Mina, I look forward to hearing how it turns out with the coconut sugar! I’ve used this as a garnish for my Ginger Bread Lemon cheese cake Dessert, every one loved it! That sounds absolutely heavenly, Diane! Great recipe, Kimberly! I’ve altered it for my own use but the fundamentals remain the same. I’ve been using a different recipe that actually crystallizes the ginger and the sugar completely but the ginger becomes too hard and I think it has a shorter shelf life. The only problem I’ve encountered is that the syrup seems to sometimes boil away before I get to 225 degrees. When it does that I’ve compensated by drying it a little in the oven at the lowest my oven will go, 170. Then it is fine. You should look for Hawaiian Ginger. It is quite abundant in the winter months as it is a winter crop here. Costco sells Hawaiian ginger here for about $7-8 for a 3 pound bag. In Hawaii we eat TONS of ginger. A side note, you need very young ginger for Japanese pickled ginger. Thank you again! Thank you, Michelle, and thanks also for all the great tips! So I think I got my quantities wrong the first attempt – is it 1/2 cup of the ginger water or 1/2 of the ginger water used in the first boil? Eek! Hi Michele, they’re one and the same. 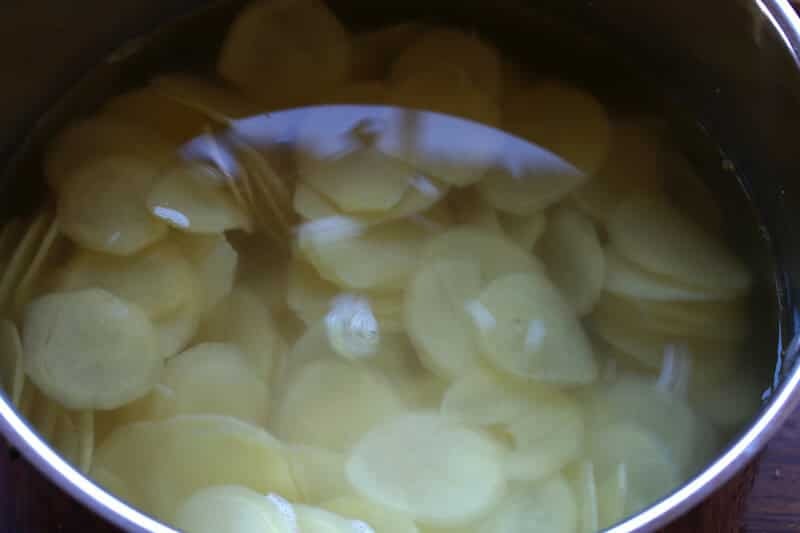 You place the ginger in water, bring it to a boil and then measure out 1/2 cup of that ginger water to use in step 2. Ah – since the original amount of water isn’t specified, I took out 1/2 of the water that I started with for my second boil. Makes sense now why it didn’t work! Thanks for clarifying! Hi Michele, there’s no specific amount, just enough water to cover the ginger, so that will vary depending on the size of pot you use. And I realized I was a little clearer in my writeup in the step-by-steps pictures than in the recipe box itself and I apologize for that. 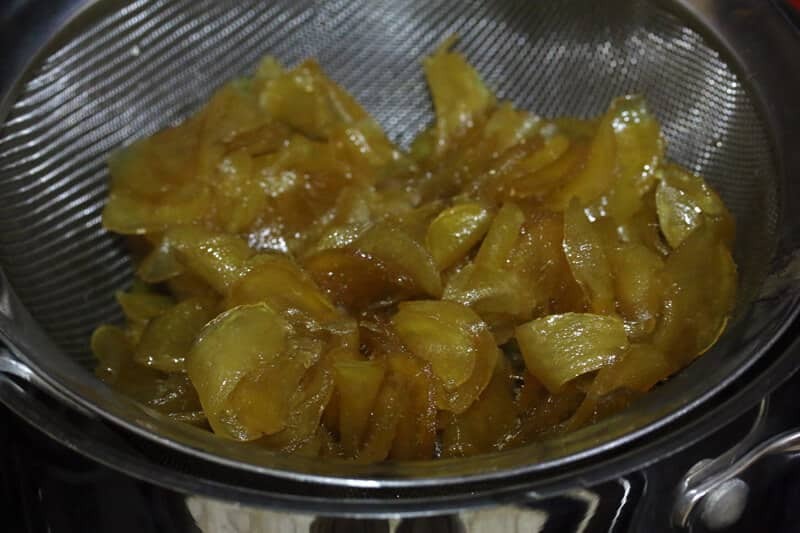 Making crystallised ginger today, my house smells divine! I’m going to add it to my Lemon Poppyseed scone mix. I love grated ginger on salads and a hot cup of ginger and honey on these cold, winter days just hits the spot! Your scone mix sounds heavenly, Jeanette, and great tip for the salad! Something my mom always made for us when we were sick with a cold was her “ginger decoction” with fresh lemon squeezed into it – it always seemed to do the trick. Please share recipe for your lemon poppy seed scones. I am in Seattle and I would try growing the ginger in a clay pot with a southern exposure, against a wall if you can, much like tomatoes since the ginger appears to like warmth. I use crystallized ginger in an orange-ginger scone that is to die for and another favorite is in a pear-gingerbread cobbler recipe I found in Taste of Home a few years ago. P.s. Have people tried draining on a spatter shield?? Thanks for the tip, Linda, I’ll have to try that. And those scones and that cobbler sound heavenly! The spatter shield: The syrup is thick and my concern is that it will pool around the ginger instead of dripping through the small holes of the spatter shield. I have used this recipe a few times and have had very nice results. I used a different recipe before with spotty results so I am so glad I found one that works. The only warning I will give is when cooking the ginger in the second phase (in the sugar water) don’t walk away from the stove and forget about it. I did this once – my bad. The burnt pan was tough to clean! I use my ginger in scone and cookies recipes and these ginger pieces works out so well. Nice to hear from you. I made some ginger yesterday and it came out perfect. Today I am using it for shortbread cookies (Ina Garten recipe)for my husband’s VFW meeting. They are so delicious! Wonderful, Jeanne! Ginger shortbread cookies sound delicious, I think I’ll need to whip up a batch of them myself :) Thanks again! I just bought 3 lbs of ginger to crystallize, and saw your recipe. Trying it today!! I love Ina Garten’s Spiced Hermit Bars that use crystallized ginger (and a rum glaze to boot)! Those sound wonderful, Kathleen, thanks for sharing! The pictures look great! Just wondering, did your ginger get hard when it finally dried or did stay more pliable and chewy? Thanks! Hi Kathryn, as long as you keep it stored in an airtight container it will keep its chewy texture. Hi Effat, scroll down to the bottom of the post and you’ll see the recipe box with the ingredients and quantities. I’ve made it before and it came out way too tough and spicy. With this recipe, it was absolutely perfect. I made it the same day I brought the ginger home from the market and I think that helped too! Thanks, Nancy, I’m so glad it turned out! Yes, using fresh ginger makes a huge difference – old ginger gets tough and stringy. Thanks for the recipe, Kimberly! I just made a batch that I’m going to give to my mom for Easter! She loves crystallized ginger and I thought it would be fun to try to make her some. I didn’t want to buy a cooling rack like the one you have pictured, but I realized I could use the racks from my dehydrator. It worked really well and even the smallest pieces didn’t fall through. Do you think I could reuse the ginger syrup for subsequent batches, say by adding the same half cup of ginger water but only another cup of sugar? I’m guessing the 225 degree mark will work to tell me when the sugar syrup has reached the right concentration. Hi Sal, that’s awesome! What a great gift, I’m sure your mom will be thrilled. That’s a great question about reusing the syrup – I’m not sure what the answer is. The 225 degree mark is simply a temperature marker for when the sugar has reached the right stage, not a concentration marker. So reusing the syrup may (or may not) result in a weaker than otherwise concentration, which means the ginger won’t set properly. I’d hate for you to end up wasting a batch, but if you decide to give it a try let us know how it goes. Delicious! This was insanely labor intensive, but was worth it. I was hoping to get a six month stash out of it but I don’t think it will last that long, haha. 1. How did you end up with so much ginger syrup? By the time the 1/2 cup reduces, there’s barely anything left. 2. My ginger grew mold after about 6 weeks on the counter. Have you ever had that happen? I stored in a mason jar. I live in NY, so it’s springtime weather now. I put it in the fridge and that seems to have a stopped it. I’m going to eat it anyway, but just curious if I did something wrong. Hi Lia, I’m glad you enjoyed it! I may have made a double batch at the time I took the picture of the syrup, I can’t remember. The only reason there would be mold forming is if the ginger didn’t adequately dry. 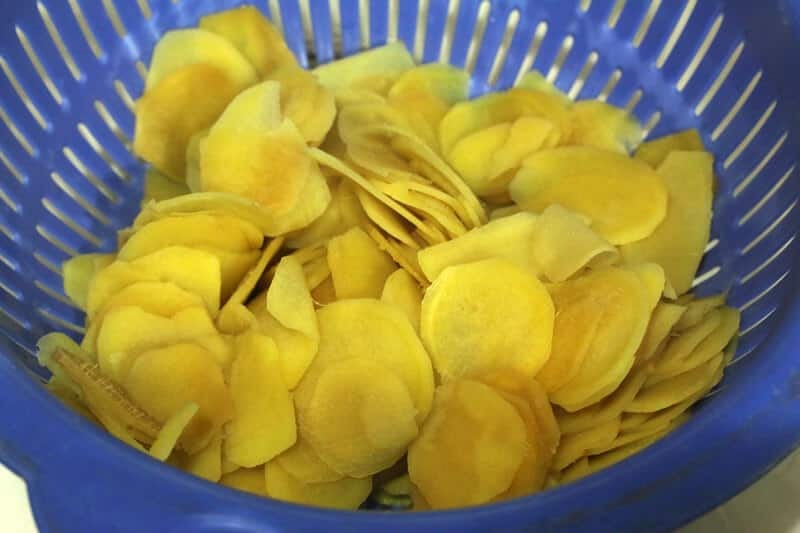 Drying time will vary depending on the thickness of the ginger as well as the humidity/moisture in the air. Must I use sugar ?? I was the sugar off the store bought candied ginger. I set it out out to dry and keep it in a container with powdery flakes of cocont. Hi Ann Marie, sugar is the acting preservative, without which the ginger will go bad. I have been looking for a recipe for preserved lemon ginger. I recently found some in Chinatown, but it is hard to find. It is not covered in sugar and is soft and has a slight lemon taste. I am going to try your recipe and add lemon peel when I boil it. Hopefully it will work. Yesterday made this recipe for the first time, as you said the only tedious part was to separate the pieces to dry. The syrup made a great tea and the results are great. The only difference I did is add a lime in quarters, but these also taste good. Thanks for the recipe from Mexico !!! Greetings to Mexico, Angelica! I’m so glad you enjoyed this, thanks for the feedback! Hey, thanks for the recipe! I didn’t read through all the comments, so sorry if this has been answered, but my dad has been using ginger for dry mouth. The crystallized ginger is just the right shape and size, but he doesn’t like the excess sugar on top. Which sugar is the preservative? Can we leave off the sugar dusting? Hi Torina, really both are – the extra dusting of sugar provides an additional layer of protection/preservation. It also keeps all the pieces from sticking together. You can leave off the sugar dusting and keep the candied ginger in the fridge to prolong its shelf life, but it may not last quite as long. Just keep an eye on it to watch for any mold. Can someone help me with recipe for Ginger balls in syrup. Please! That ice cream sounds phenomenal, Rosita, thanks for sharing! I don’t have a wire rock can I put it on my cutting board to dry? H Eileen, yes you can do that. It just doesn’t get proper air circulation so once the top part is dry you’ll need to turn them over to ensure the bottom is adequately dried. Trying to figure out how to make this on my own, I discovered instead a wonderful ginger hard candy. Clean and shred the ginger boil it in a couple quarts of water to make a very strong tea. Strain out all the solids and return the water to the pot. Add sugar and corn syrup in the same proportions for making hard candy with the Loraine oils. Add a stick of butter and cook until hard crack, about 300 degrees. Pour out on lightly greased cookie sheet and when somewhat cooled, score it with a pizza wheel so you can break it into bite sized pieces. Coat with powdered sugar and put in bags or jars. Awesome, Bob, thanks for sharing! I am so excited to try this! I have lots of food allergies and often have tummy problems, so I keep a jar of candied ginger by my bed. I’m just not a fan of how much sugar is on them. I wonder if making them myself I can cut out a little of the sugar and have a lighter dusting of sugar on them. If this works, I will have to make them for my mom! She will be thrilled!! Hi Pam, you can cut back on the sugar but I would make smaller batches because it won’t keep as long before going moldy (the sugar also acts as a preservative). Thanks for your comment on the organic ginger. My wife, from Vietnam found that using t non-organic ginger from our local market created a useless end result. She believes that the ginger, labeled product of USA, is actually Chinese. When she used the organic product the results were perfect. Perhaps there is a chemical additive responsible. Thanks for the feedback, Steve, and I’m glad you enjoyed this, thank you! Just thought you would throw in some generalized, random racism? Why, because it’s from China, do you recommend buying organic? Organic doesn’t mean chemical-free, it’s a widely-debunked con loved by supermarket bottom-lines the world over. Chinese producers rely on repeat business to stay viable. It is not in their interest to do anything that would alienate customers. Stop reinfocin* untenable stereotypes about Chinese farming. Mike, yes, I recommend avoiding purchasing ginger – and all foods – imported from China. Racism has nothing to do with it, safety is the issue here. You need only watch the news or do a cursory search online to learn of the repeated food safety scandals. Do you remember the baby formula scandal in which 54,000 babies were hospitalized? Or the bean sprouts treated with sodium nitrate, urea, antibotics and plant hormones? Or rice contaminated with heavy metals, including cadmium? Or when the FDA advised us to avoid all toothpaste made in China because it was laced with anti-freeze? There are entire articles that list the Chinese food scandals throughout the years. It is also common belief among Chinese citizens that their own government officials even have their own private farms, from which to source their own personal food, in order to ensure it’s safety. I know about the baby formula issue – I worked for the New Zealand company at the centre of it. All the issues you mentioned are Chinese internal consumption issues, made by unscrupulous factory owners. Honestly, I would avoid US-manufactured food a long time before Chinese – your farming practices, your steroids, GMO content, your unidentified ingredients, your sugar and HFCS- laden products are abhorrent. I eat Chinese produce close to every day, living in the South China Sea, and have done for years. It’s high-quality, well-regulated and arrives fresh. FWIW I have seen a doctor in decades. In the last two years, thanks to a push by the local US embassy, the high-quality Australian, New Zealand and British foods we used to see have been supplanted by US produce, for which information about content is very difficult to obtain as your labelling requirements are so poor. If you spend your life believing the kind of hysterical rubbish that passes for news about China in the US, you’ll believe anything. Including that you are not motivated by racism. Mike, my pantry is stocked full of ingredients from all around the world – from Greece to Thailand and Japan, from Peru to the Middle East. I grew up in a melting pot of nationalities and ethnic backgrounds with close friends from all around the world and yes, including Chinese friends with whom I spent hours and hours cooking and eating together. As for news sources citing Chinese food scandals, I’m from Germany, also spent several years in England, and I continue to source my information from a broad array of international news sources – all of which cite the same evidence. I recently read a newspaper report from Tokyo noting that Japan’s health ministry has reported that of all of their imported food, China ranks highest in food violations by far and consequently Japan has enacted very stringent quality control on Chinese imports. I agree with you on your point about food practices in the U.S., things I was well aware of before I moved to the U.S. I won’t hesitate to agree that the U.S. government allows far too many alarming things to be in the food supply. For that reason we grow many of our own vegetables and fruits, raise our own chickens, avoid pre-prepared foods, and buy our raw milk, pasture-raised pork and beef from a small private farm just a couple of miles down the road from us that uses non-GMO animal feed and avoids the use of steroids, antibiotics, hormones, etc. Food quality is very important to our family and just as we seek out the highest quality foods we can find, we likewise use caution in avoiding any that are questionable, regardless of what country they come from. I have to agree with Mike, I think your comment about Chinese products was racist indeed, and your defense even more so. Let’s not go into how bad US food quality is (and their dietary recommendations)…it will take all day. You do admit there are numerous concerns about US grown/produced food and hence control much of your own, yet you wouldn’t make a similar comment–“don’t buy food from the US”. How is this not biased or racist? I think you need to take a good at your denial. The sugar content of this recipe is awful, and your comment “ginger has some great health benefits that can override the sugar” is dangerous. How are you qualified to make such an assumptive comment? I think it’s the opposite–the damage from so much sugar will override any benefits of the ginger. With Americans getting fatter and sicker more than ever and about to break our health system, I don’t think promoting such a sugary recipe is responsible. We don’t need a substitute for candy any more than we need a substitute for cocaine. “The sugar content of this recipe is awful.” This is a recipe for candied ginger, what do you expect? The sugar is also the preservative that prevents the ginger from going bad. “Yet you wouldn’t make a similar comment – don’t buy food from the U.S.” Actually, I do. Often. I regularly recommend that my readers avoid certain foods, including pre-packaged/pre-prepared items made in the U.S.. Does that make me racist towards Americans, too? As a final point on your accusation of racism, I would direct you to the dictionary so you can educate yourself on the REAL definition of racism. I’ll give you a hint: It applies to people, not to a government’s poor food safety regulatory environment and practices. A copule Of months ago I trayed sweet ginger. I felt inlove inmidiatly. I have been looking for a recepie and this one looks great. I will do it tomorrow. Thankfull for sharing. Thanks, Ari, let us know what you think! I make this recipe once a year using 4-5 pounds of ginger. After the cook I do place on a cooling sheet with parchment paper. I keep all the excess dried sugar and ginger crumbs – and there is quite a bit hopefully – in a jar in the fridge to add to nuts to make a muffin crumble topping. No matter what kind of muffins you make…chrystallized ginger makes them POP! I divide the cooled final product into smaller sizes and use a food saver to store in bags that I keep in the fridge all year…for gifts, snacking, recipes etc. Fantastic, Penny, thank you! 4-5 pounds at a time is one large undertaking but I’m sure the effort is well worth it – thanks for the storage tips. I have been eating some crystallized ginger I bought in a supermarket in France, it’s been hiding behind jars in the larder. I am eating it very slowly to try and make it last. I actually looked at the label today to discover it is dated 2013 !!! It still tastes great,but I am going to make some now, need to find organic but shouldn’t be too difficult as there are a few online organic products and box schemes in the UK. Jennifer. I had to laugh out loud, Jennifer, because I can totally relate to that scenario :) So often when I purchase food gems during my travels and bring them back home, I’m so reluctant to use them that they just end up expiring! You’d think I would have learned my lesson by now but that still happens :) Have fun making your own candied ginger, I think you’ll find the effort is well worth it! Hello! I am just wondering approximately how many cups is the peeled and sliced ginger. I don’t have a scale so I’m trying to estimate. Thank you so much! I’m using this recipe so I’ll have crystallized ginger to use in the brine for my first ever Thanksgiving turkey! Thanks for helping me make an ingredient I couldn’t find in the stores but have long been intrigued by. Mine came out really bitter, very spicy, tough, and not very good :'( The syrup is delicious though. I love ginger, but this did not come out as expected. Not sure if it was the type of ginger I used? I’ll have to try again..
Any tips on softening the ginger and reducing the spice? Hi Sarah, the flavor, spiciness and texture is entirely dependent on the ginger itself – the rest is simply sugar. The younger and smaller the ginger the more tender and juicy it will be and the more mild/less spicy it will be in flavor. Older ginger is tough, fibrous and much spicier. So it’s all about carefully selecting the ginger. Hi, How do you tell the difference between fresh young ginger and older ginger. Is it in the size of the pieces? So glad I found your recipe. Hi Maggie, yes, generally the larger it is the older it is. Also, when you cut into it if it’s really stringy that’s the surest sign that it’s old and tough. I received a large amount of fresh ginger in my organic box and looked for a way I could preserve it. 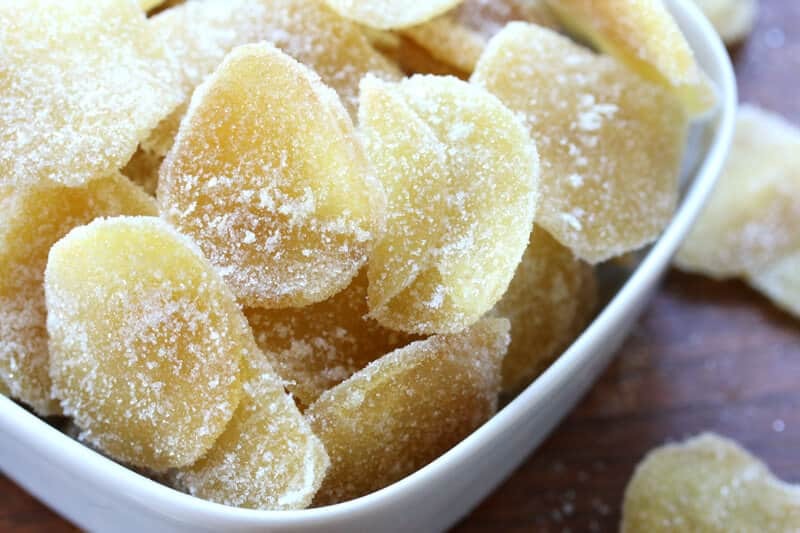 After researching a number of candied ginger recipes, I thought your’s seemed the easiest. It WAS! I am so pleased with the result of the ginger and the simple syrup. I can’t wait to start using it. Thank you for sharing it. Wonderful, Janine, thanks so much! A dear friend of mine was just diagnosed with breast cancer and is starting chemo soon. I am making her a batch of this to help ease her nausea from the treatments and give her a treat that also helps fight cancer. So glad I found this recipe. Hi Amy, that’s a really kind gesture. If I can make a recommendation though, I would talk with the doctor to make sure it’s okay for her to eat sugar while she’s undergoing treatment. This is awesome recipe I found so useful. Thanks for sharing this. Hi Manoj, I would keep it in the fridge and it can last for several months – just keep an eye on it and periodically check for any mold. Thank you!! First time I used regular grocery ginger – what a mistake. All that time to peel and slice. Next time I invested in some organic, every part is usable and the taste is FAR superior. Haha! And you didn’t share, Martin??? I can’t say I blame you :) I’m so glad you enjoyed it, thank you! I live in Taiwan and my neighbors are ginger farmers. They sell big bags 1 lbish cheap, but its too much for me and my daughter so I end up tossing most of it in the compost. Today I made ginger candy with this recipe and it turned out great, a little too much work (peeling) for a lazy Sunday afternoon, but glad I did. Bonus on the syrup and extra water (hair rinse)!. I’m going to make this all the time now, thanks. Wonderful, Kathy, thanks for the feedback! After simmering my sliced ginger both the slices and the water is dark grayish..not light yellow…it doesn’t look very nice…shall I continue with the syrup? Hi Russell, I’m not sure what’s causing the gray color but what matters most is the taste not the color, so as long as it smells good I would proceed. I was so excited to see this recipe available online that I rushed out and bought what I needed to make it. Last night I spent a long difficult time peeling, intending to make a batch this morning. The problem is we started a heat wave today and that always brings out ants. How can I protect the drying ginger from the ants? Thanks for any suggestions. Carol, Santa Barbara. 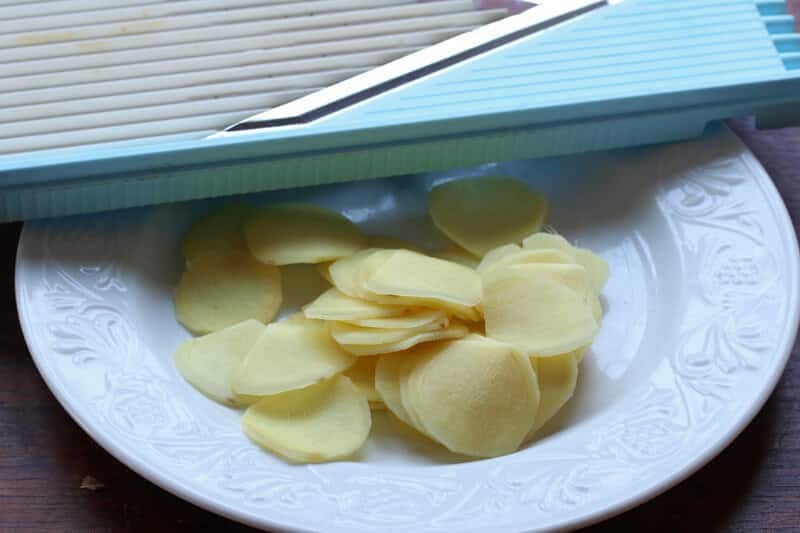 One tip for peeling Ginger is to use a teaspoon to get the skin of the tubers. Beats using a knife, also candied ginger makes a a delicious chocolate treat. Use a double boiler to melt chocolate of your choice and dip the candied Ginger in the chocolate to coat it and then put it on rack or non stick baking paper to cool. If you are ever in Australia and visiting the State Queensland, make sure you visit the Ginger factory at Yandina, North of Brisbane, it is Ginger heaven. Thanks for the great tips, Kerrin, and I will definitely keep the ginger factory in mind when we visit Queensland, which we will! Are these soft enough to go through a toothpick/skewer? If not, can I adjust thickness (or another adjustment) to make them softer? Yes, you can stick a toothpick through them. The thickness is what determines the softness – if they’re extremely thin they’ll be very hard. Cool… thanks for the quick response!!! I just ordered a candy thermometer and can’t wait to try this! If it works out, I’ll definitely invest in a mandolin, but this time I’m going to have to try slicing by hand. Would you recommend trying to stick with 1/8 inch slices like you specific in the recipe or going a little thicker to get the soft, toothpick-sticking consistency I’m looking for? An 1/8 inch should be fine, maybe slightly thicker. And don’t throw away the pealings dehydrate them and use them in a tea ball to make ginger tea! Anybody dare try this with a different t type of sugar? Something vegan I mean. Josiah, you should not have any trouble with using vegan sugar. What makes most sugar non-vegan is that it is refined through bone char. Vegan sugar is the same exact product except it hasn’t been put through this process. There are several companies that even make a granulated vegan sugar. Sugar that is considered vegan has all of the same preservation properties that refined sugar has. Whole foods sells candied Australian ginger. It’s amazing. Not as hot. I’m looking for the Australian ginger to make this recipe. Thanks for this! I was looking for the candied ginger recipe and found this! I am so eagerly to try this! But i couldn’t find the amount of sugar i should put in the water for making ginger syrup. Could you please kindly advice me? Thanks! Hi Sophia, scroll down to the very bottom of the blog post, past the step-by-step preparation pictures, and you’ll see the actual recipe box with the list of ingredients and instructions. It will give you the quantities for all of the ingredients. The secret to drying the ginger is use a sillipat liner on a half sheet pan, be sure to separate the ginger pieces and put in the oven (oven is turned off) with the oven light on overnight (10-12 hours). Next morning the ginger will be a bit sticky and ready to toss in the sugar. Leaving the oven light on gives just enough warmth to adequately dry the ginger. Thank you for the recipe you gave. I have tried this recipe, even though there have been a few incidents, because after I boiled the ginger, there was very little ginger water left. I had to boil the ginger again for 5 minutes to get extra water. Sharing a little story, maybe because I live in Indonesia (a tropical country), then I don’t need to take long to dry ginger. And the ginger syrup I produce is darker, whereas the amount of sugar I use is less than the recipe, because I’m afraid of being too sweet. The reason could be because of the ginger and sugar that I use in Indonesia. But most importantly, I’m happy because the results are so delicious, even though this is my first try. I’m so glad you’re happy with the results, Dahliani, thanks for the feedback!